This is an update of the situation as of 10 am JST Wednesday 16 March. First, the situation is clearly (but slowly) stabilising. As each day passes, the amount of thermal heat (caused by radioactive decay of the fission products) that remains in the reactor fuel assemblies decreases exponentially. When the reactors SCRAMed on 11 March after the earthquake, and went sub-critical, their power levels dropped by about 95 % of peak output (the nuclear fission process was no longer self-sustaining). Over the past 5 days, the energy in the fuel rods dropped by another ~97 %, such that the heat dissipation situation is getting more and more manageable. But we’re not out of the woods yet, and the reactor cores will need significant cooling for at least another 5 days before stability can be ensured. Yesterday there appears to have been a fracture in the wetwell torus (see diagram: that circular structure below and to the side of the reactor vessel) in Unit 2, caused by a hydrogen explosion, which led to a rapid venting of highly radioactive fission product gases (mostly noble [chemically unreactive] gases, the majority of which had a half-life of seconds to minutes). It also caused a drop in pressure in the supression pool, which made the cooling process more challenging. However, despite some earlier concerns, it is now clear that containment was not breached. Even under this situation of extreme physical duress, the multiple containment barriers have held firm. This is an issue to be revisited, when the dust finally settles. Japan’s nuclear crisis intensified dramatically on Wednesday after the authorities announced that a second reactor unit at the stricken Fukushima Daiichi plant in northeastern Japan may have ruptured and appeared to be releasing radioactive steam. The break, at the No. 3 reactor unit, worsened the already perilous conditions at the plant, a day after officials said the containment vessel in the No. 2 reactor had also cracked. Japanese officials subsequently said that the explosion had damaged a doughnut-shaped steel container of water, known as a torus, that surrounds the base of the reactor vessel inside the primary containment building. Ruptures in the torus are serious, said Michael Friedlander, a senior nuclear power plant operator for 13 years at three plants in the United States, including three years at aGeneral Electric boiling water reactor very similar to the ones in trouble in Japan. But the torus is not as important as the reactor vessel itself, which has 6.7-inch-thick steel walls and 8.4-inch-thick steel for its roof and floor. The vessel is designed to hold very high-pressure steam as well as the uranium fuel rods. 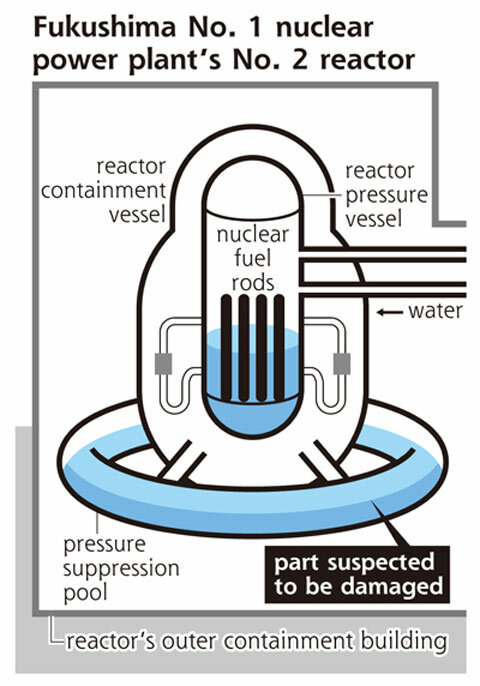 The reactor vessel has 20 safety valves that during a shutdown of the reactor inject steam into a million-gallon “suppression pool” of water in a steel torus immediately underneath it. “Imagine if you had a big pressure cooker and you had a tube off the pressure cooker into a big tub of water — the suppression pool is the tub of water,” said Mr. Friedlander, a defender of nuclear power who is now a money manager in Hong Kong. Steam vented into the suppression pool from the reactor vessel is not supposed to be radioactive. But it becomes radioactive, and potentially very radioactive, if the fuel rods in the reactor vessel above have begun to melt. Barry Brook and BNC often differ from credible sources and expert opinion. I haven’t kept note of all the nonsense that I’ve seen on his blog, but this is a good example: http://bravenewclimate.com/2010/08/10/np-cc-pamphlet/ – a ready-to-print ‘business card’ that says nuclear power is the only solution to climate change and ‘Renewable power does not work’. IMO Barry Brook is to energy as Anthony Watts is to climate science. Brook exemplifies the nuke ideologue: complete denial of reality in order to promote his obsession with nukes. While Brook and the nuke fan club claim renewables don’t work, Scotland is heading for 80% electricity from renewables by 2020, Denmark 50% from wind alone by 2025, and Germany is determinedly heading towards 100% of all energy from renewables by 2050. All of those are impossible if we believe Brook. I’m going to take demonstrated reality over denial of it in preference for a technology that continually demonstrates it is expensive, unreliable and highly dangerous….